Home Latest News ERP Is business software mobile ready? Is business software mobile ready? The answer to that fundamental question is probably not yet according to a recent survey entitled ‘How mobile are UK businesses? It revealed that 72% of business leaders do not find it easy to carry out work from a mobile device. The survey was carried out by Atomik Research, sponsored by Priority Software Ltd. Priority are a global ERP software company founded in Israel with more than 8,000 customers. 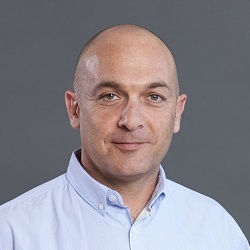 In addition to a significant share of market in Israel they have start-up operations in the UK and the US. 501 respondents from senior roles across businesses completed the survey. Priority made the data available to Enterprise Times for a deeper analysis. This provided some additional insights above those that are contained with the Priority infographic. The survey demographic information was in itself interesting. Atomik Research defined senior management as either Owner, C Suite, Director or Manager. The target market was companies with between 50 to 800 employees. The majority of respondents (69.23%) being in the 100-500 employees range. The size of the company determines the willingness to allow employees to use business applications on mobile. In larger organisations, those with 250+ employees, more than 92.6% allow employees to use business applications on mobile with 90.2% saying it increases productivity. Smaller companies are slightly less willing to let employees use mobile apps (83.7%) and only 78% believe that they increase productivity. Is there a generational difference? Barely. The over 45’s do find it harder to manage from a mobile device (>15%) as opposed to their younger colleagues (<5%). There is negligible differences in the younger generations although all of the respondents under 34 had mobile apps installed. The survey did not clarify whether these were personal or business related.15% of the over 55’s had no apps installed, showing that while there is still an age gap, it isn’t that different. So why are mobile apps not accepted. There appears to be several reasons for this highlighted by the survey. There were three key factors. The first is that the software does not yet do everything that business leaders and employees need. Interestingly there is an unasked question about whether a mobile device is suitable to carry out these tasks in all organisations. The second is around culture with 34.5% believing that mobile working has an impact on team culture. Interestingly there was little variation on this answer across the age groups. That goes against what other reports often reveal. A factor here could be that it is business leaders responding to this rather than employees. The third area is that there is still a lack of trust for employees working outside the office. 36% of the respondents do not believe that employees are as productive off site as in the office. Interestingly the under 24’s and over 55’s trusted employees the most. Across industries the segmentation of this trust factor was as one might expect. Only a few industry segments such as Manufacturing, Finance & Business services, Education and health & social work had sufficient respondents to make any analysis valid. Manufacturing trusted its employees least outside the workplace. However, the culture of most manufacturing organisations is of working in a single location. The results were as expected across the remaining industries. Real Estate had the most trust. However, as the industry is shedding its shop fronts during a digital transformation that is hardly surprising. 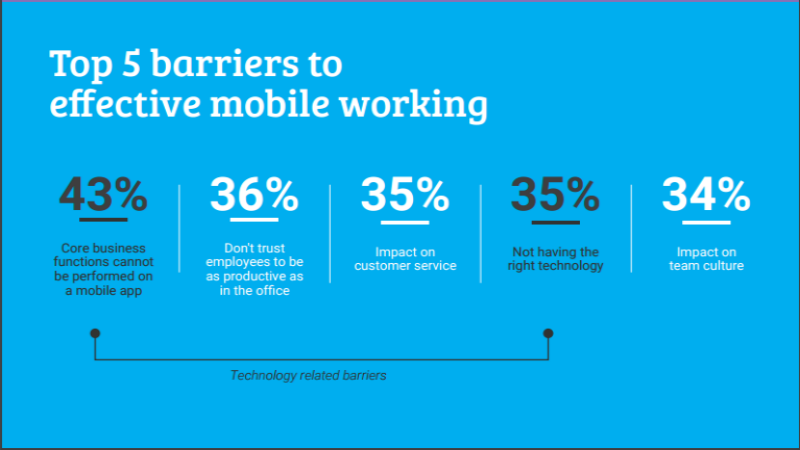 As a snapshot of attitudes towards mobile working it has some interesting insights. There is still much work by ERP vendors to make their mobile apps better. Priority recently unveiled its mobile app generator. It launched a Web/Mobile Software Development Toolkit (SDK) alongside the recent Priority v18.0. This will allow organisations to rapidly develop and deploy applications alongside its ERP software. They are not alone, Rootstock has announced RootScan and other vendors also having mobile development toolkits and/or mobile apps. If Priority repeat this survey next year it will be interesting to see the trend among business leaders. Across the whole survey there were variances by industry and age but they were not always as significant as observers often call out. A repeat of the survey will show if trends are emerging around the rise of mobile apps and their usage. However, there may still be some industries and functions that lag behind. So how mobile are UK businesses? There is still a lot of work to by vendors and companies in this area. Mobile applications and to an extent devices need to improve to the point where they are simple and easy to use. Companies need to embrace cultures that make agile working the norm. This means measuring outcomes as much as outputs and building trust across and within teams. Not all companies are going to embrace agile working and in some environments it might not be the best practice. Mobile applications for ERP software are a huge issue in the U.S. as well as the U.K. To my knowledge, no other ERP software here in the States has the ability to create mobile applications from any form in the system in a matter of minutes without programming. For example, we created a customer portal where customers or salespeople can modify or add customer data, check the status of sales orders in Priority and modify data if they have permissions. It can be accessed via tablets (iPod or Android), iPhones, Android or Windows phones. Very cool. Thanks to Priority Software for the interesting and timely post!